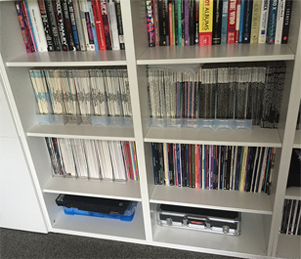 Musicians are typically people with a lot of books and I’m no exception: here in my office, I have shelf after shelf groaning under the weight of all the tuition and transcription books I’ve accumulated over the years, not to mention my extensive collection of bass magazines. The problem with having a lot of books is that they take up space. Lots of space. They’re also pretty cumbersome, meaning you can’t easily take many away with you when travelling. During my time as a touring musician – when I would often be away from home for weeks at a time – I often wished for an easy way to take a large selection of books with me. Consequently, I was very excited when Apple announced the release of the iPad. Surely this would be the answer, a way to store my book collection digitally? With this in mind, I found myself in the queue outside the Apple store on the day of the iPad’s release. It took a while, but eventually digital publishing began to catch on. Amazon’s kindle format took care of text-based fiction, but proved to be less than ideal for music books which by their nature, require a lot of illustrations. Numerous PDF readers for the iPad also sprang up, meaning that any books that I had in PDF format could be read on the device. Believe it or not, I was so committed to a digital book collection that I actually spent a considerable amount of time scanning my books into PDF format (yes, it was worth it). Fortunately, Apple recognised the need for a more comprehensive digital book format and released the iBooks Author software in 2012. I downloaded it on the day of release and immediately began learning to use it: although it has a fairly steep learning curve, my experience with page layout software such as Quark and Indesign meant that I was up and running fairly quickly. The only real drawback was that initially books could only be created in landscape format, which is not ideal for music books. My first iBook was a digital edition of The Bass Player’s Guide to Scales & Modes. I tried to take full advantage of the new format – lots of nice photography, video where possible and all of the audio required for the book was embedded right there on the page next to the exercise. As a format for learning music, it’s incredibly cool. The book sold well (and continues to do so) and so I was encouraged over the next couple of years to develop further books as iBooks. Apple eventually incorporated portrait format into the software, meaning that finally I could release my books digitally with much the same layout as their physical counterparts, with the added bonus of including audio and video. You can check out my iPad titles here. As a writer and publisher I’m always looking for new mediums in which to present my work so I was excited when I was approached by fellow bass player Stefan Redtenbacher of Knowledge Rocks. His company have developed an iPad app which allows musicians to purchase sheet music with embedded audio. The clever part is that the software follows the music through as it plays, acknowledging repeats, codas and other navigational directions, meaning that the reader has no awkward page turns to worry about. There’s also the option of including multiple audio files within the same piece of music, meaning that the user can either play along with the original, or a backing track. 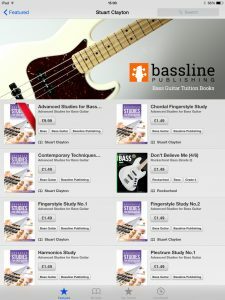 This new format seemed perfect for my latest book Advanced Studies for Bass Guitar, a series of ten challenging pieces written specifically to help bass players work on various techniques. Having downloaded the free KR Author software, I began putting the pieces together with the guidance of Stefan and his team. Fortunately, the software is extremely easy to use, with each piece requiring about ten minutes of configuration in order to allow the reader to navigate through the music successfully. The results are stunning, and in the days since putting my book together in this new format I’ve begun thinking about the possibilities for the future, not only as a publisher, but as a teacher too. The KR format has a lot of classroom potential and I’m looking forward to to using it in my classes at BIMM over the next year. If you’re interested in checking out the KR player and my KR titles, you’ll need to download the app onto your iPad: https://itunes.apple.com/gb/app/kr-player-sheet-music-reimagined/id595664677?mt=8. Once installed, navigate to the store. Got several of your iBooks and the layout is impecable, thanks Stu.